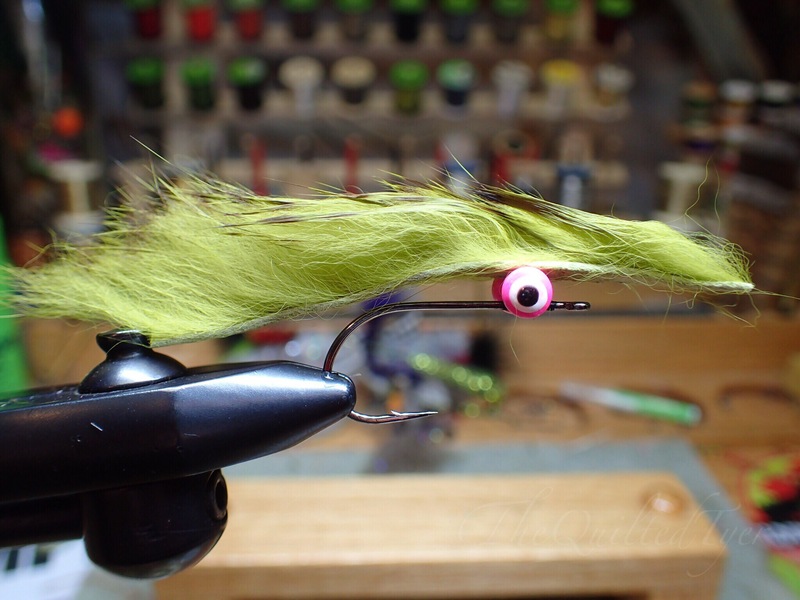 This fly quickly became the only bass fly I cant be without, and to this day, still puts more smallmouth in the boat for me than any other. 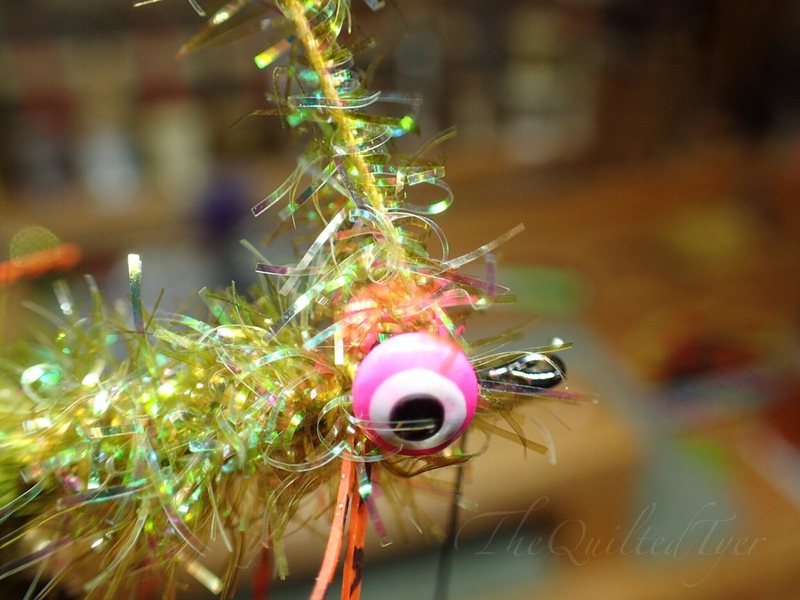 The first place I saw the sparkle grub pattern was in the book titled “Smallmouth Strategies for the Fly Rod” by Will Ryan. I read it cover to cover and to this day I still have it on my shelf for reference. There was a black and white sketch of it on one of the pages, and originally the fly had marabou and crystal flash for a tail. I fished it like that for a while but eventually changed that to rabbit and then down the road added rubber legs. Over the years I have seen it tied by others in this upgraded manner as well, so we all must be on to something good! 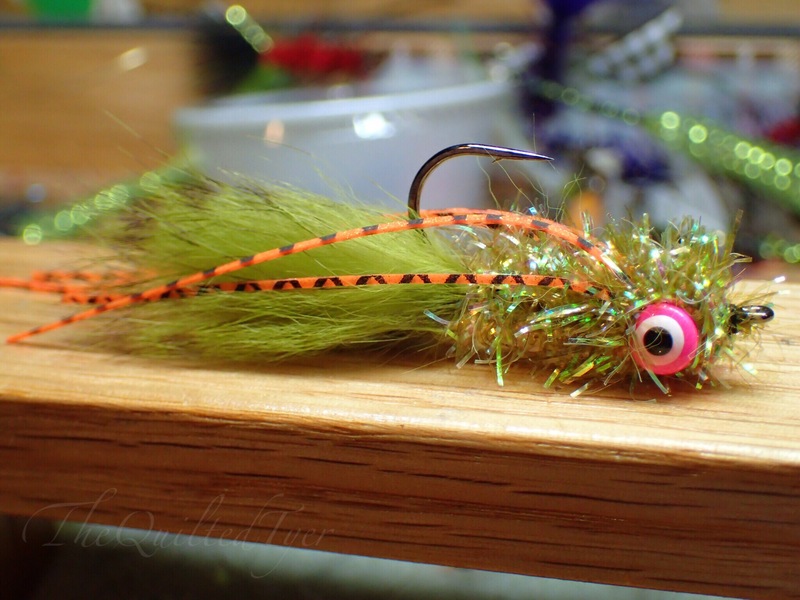 This fly works incredibly well, and in all conditions. 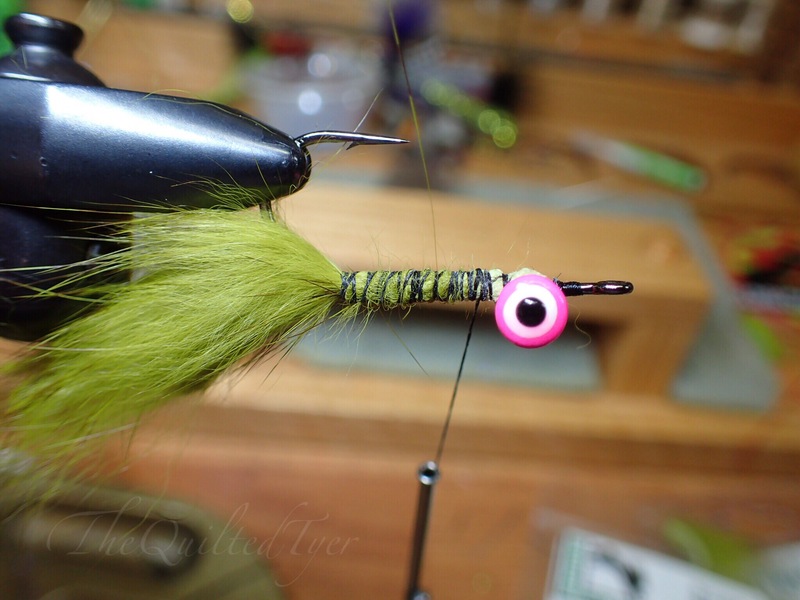 While I couldn’t possibly tell you what initially drew my eye to it, this version has been a staple in my fly box ever since. Feel free to change the colors in any way that you’d like, but I highly recommend tying some in the colors shown here. Over the years I have tried other variations but for me I have plenty of had days where this color is all they want. The first thing you want to to is attach the dumbbell eyes. 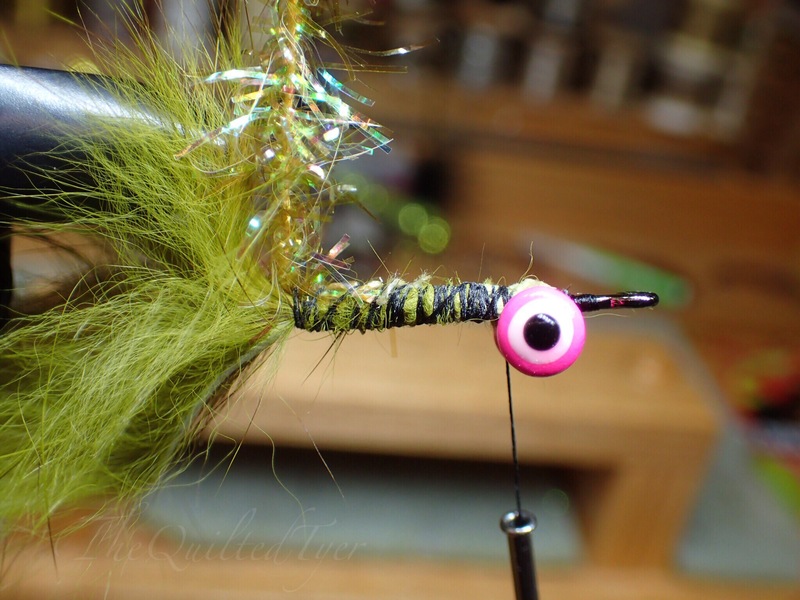 Be sure to leave enough room behind the eye since there will be a few wraps of Estaz at the head of this fly. 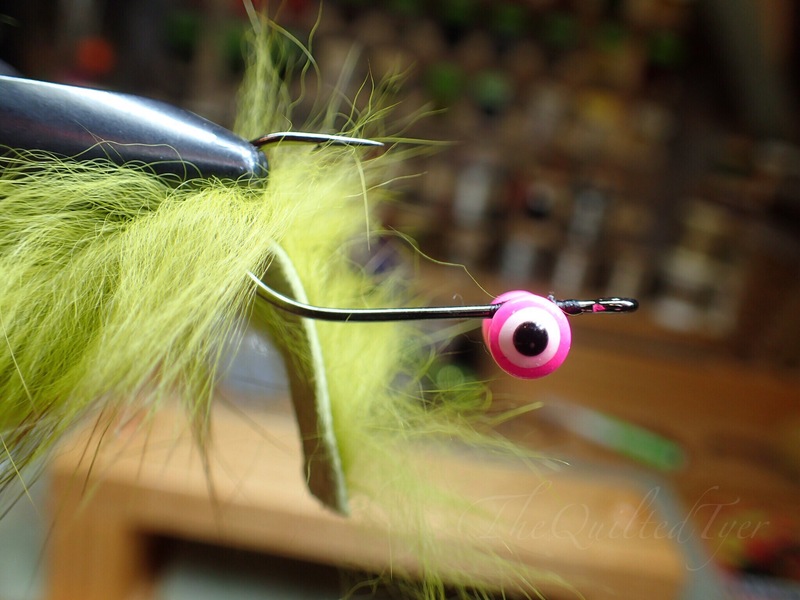 If you will be tying multiples of this fly I recommend tying all the dumbbell eyes on to your hooks, adding head cement, whip finishing and then cutting your thread. Once the cement is dry you can then go back and continue the rest of the flies. This is why I have no thread attached to the hook as I begin this step-by-step. If you need help lashing the dumbbell eyes to the hook, please see the instructional here. It will open in a new window so that you can continue with the pattern. 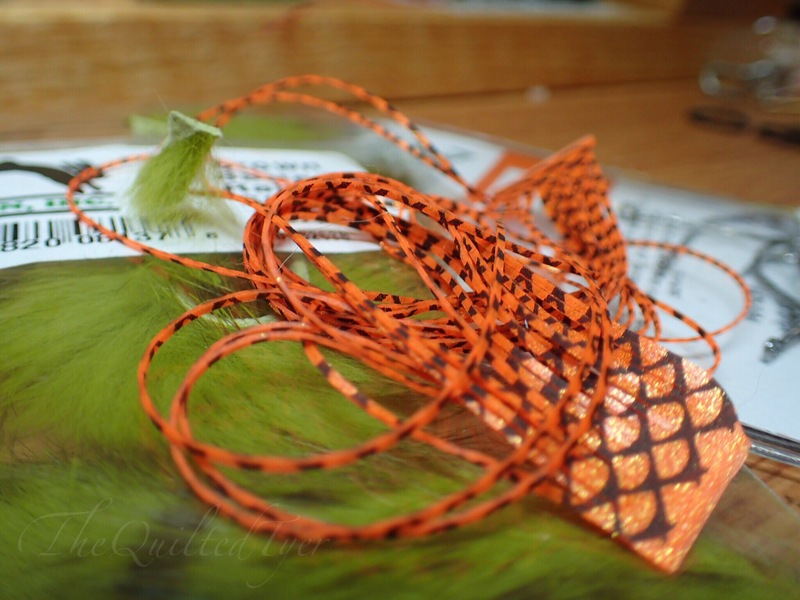 Rabbit strips give this fly a lifelike movement, but the material in itself has a tendency to slide around the hook if not properly secured. We are going to do this by piercing the strip with the hook point and then tying it in. 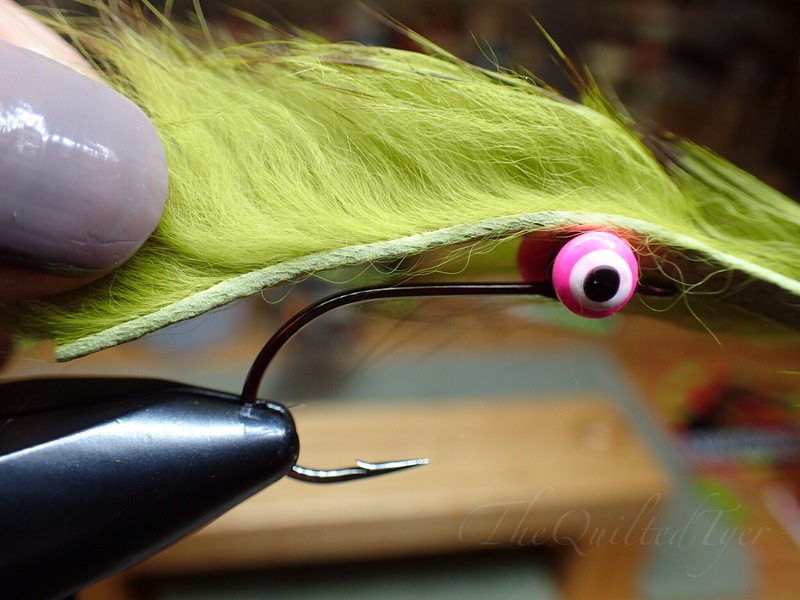 Grab a length of rabbit strip and place it over your hook so that you can eyeball the length. Cut a piece that’s about twice as long as the hook itself. The first thing you want do before you secure the tail, is to make sure you have your material facing in the right direction. With that I mean the natural flow of the hair should be heading towards the hook bend. You may need to get a little bit of water to help control the fly away hair. Just dab the water on your fingers and run it across the material. The simplest way to get a good idea on length so that you dont waste too much material, (and dont have a foot and a half of rabbit hanging off your desk) is to place the strip on top of the hook. The length that you will actually need is to be measured from behind the dumbbell eyes, extending one hook shank in length off of the bend. BUT, that ‘one hook shank’ refers to the measurement of the leather underside of the strip only. Not the actual fur. If you were to only measure the tail to the to tips of the fur, your tail will be too short. For example, look at the photo below. All I would need to do here is cut it from behind the eyes, then continue with securing below. You also want to make sure that the natural flow of the fur is headed towards the bend. 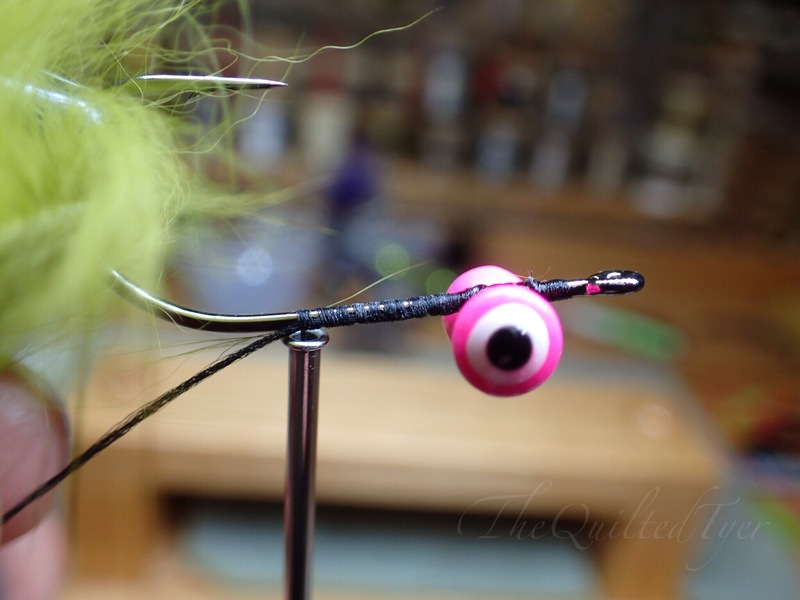 Place it on top of the hook and if the fibers are flowing towards the back of the hook, then you’re in good shape. If not, then simply turn it around so that its facing the same way as the photo above. 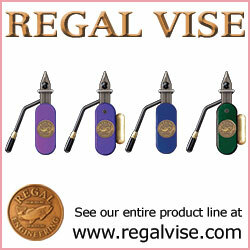 Now you need to locate the best area to pierce the strip onto the hook point. Once you have an approximate length on the rabbit strip, you need to decide the best location to pierce it with the hook. The simplest way to do this is to lay the rabbit strip on the hook at the approximate length indicated above, and then grasp it right where it sits over the hook shank, as it starts to bend. Hold that in your hand and turn your vise over. As the old saying goes, “There’s more than one way to skin a cat”, and while the same may go for rabbits; I have only found one good way to secure it to a hook. 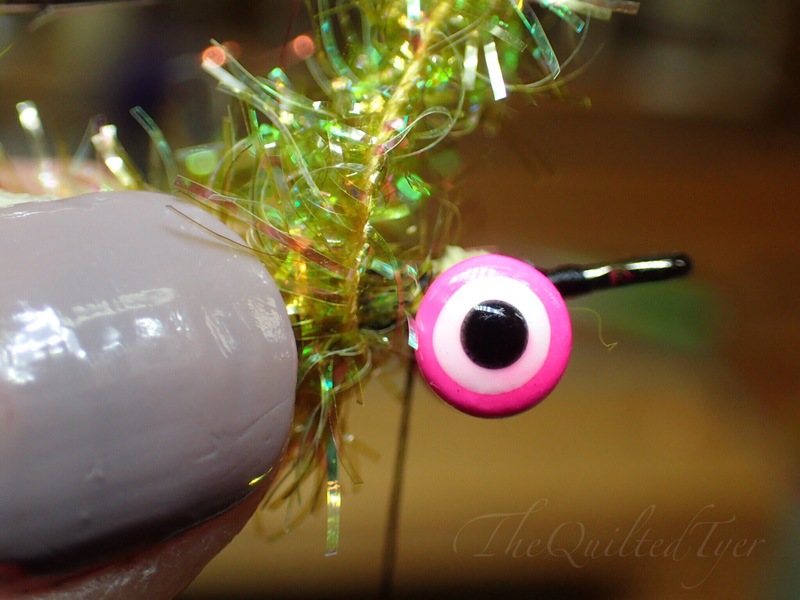 While you are still holding that measured section in between your two fingers, turn over your vise. Don’t let go of that spot! Because what we are going to be doing now, is attaching the rabbit strip to the hook, by way of the hook point. Hold onto that material as you flip the vise. Now place the hook point on the leather bottom of the strip in between your fingers. Make sure that you have it centered or it will rip the material after it goes over the barb. Once you have the leather on the hook, just enough to be able to let it go without the material falling off; use two hands to pull it towards the hook bend and snap it over the point. Just like this. This is what you want to see. 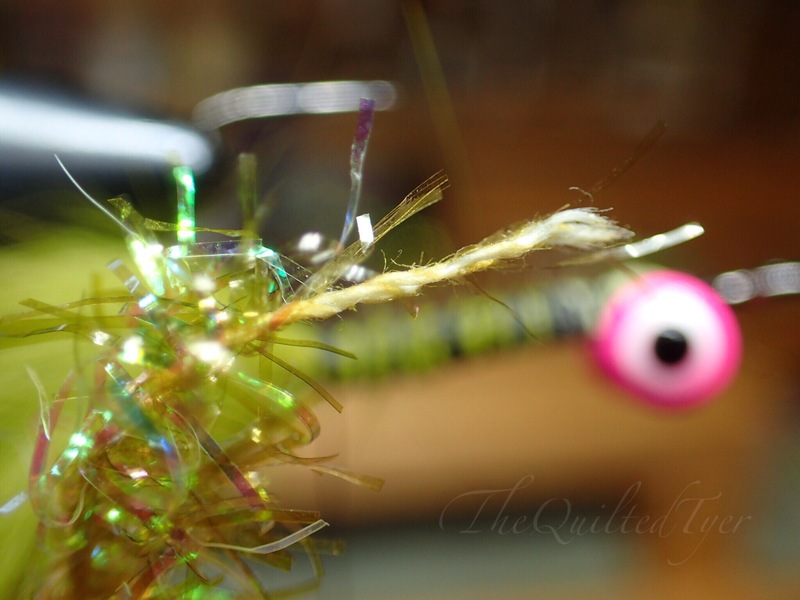 You cant tie the rest of the fly in this position, so you will need to remove the entire hook it from the vise, slide the material down and place it back in securely. 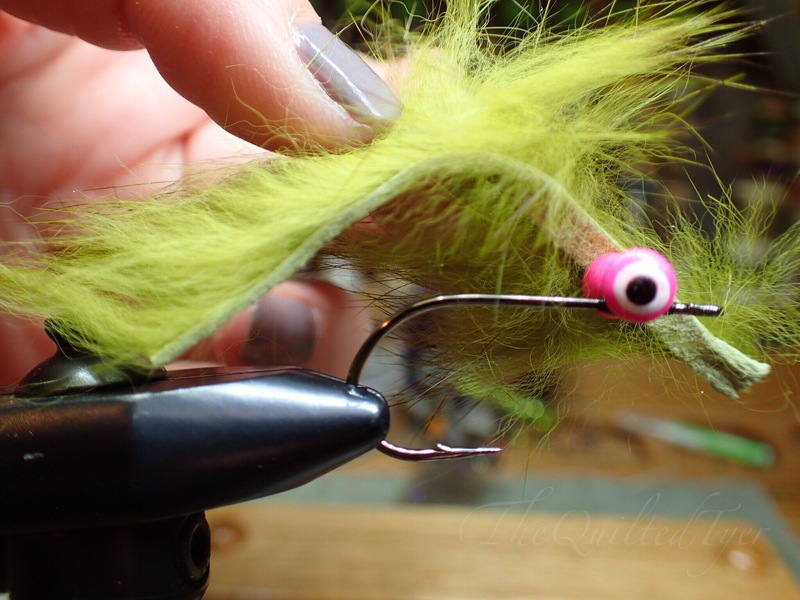 Remove the fly from the vise, slide the rabbit strip down the hook bend and then re secure it into your vise. Start your thread behind the dumbbell eyes, but before you do anything else you need to make sure that your strip is facing the right direction. A thread base should be applied before continuing. Grab your rabbit strip and pull one end towards the hook eye. 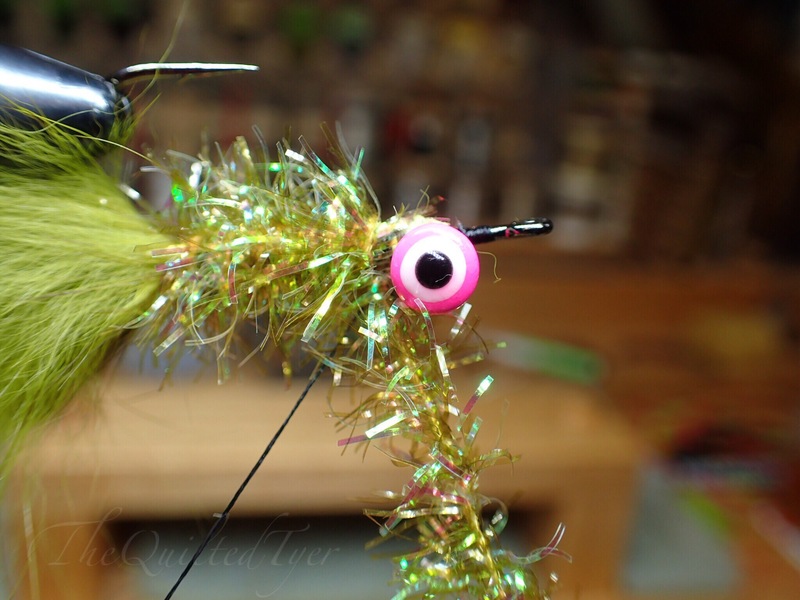 These flies ride hook point up so the way that you tie in the tail, is the way that the tail will stay. This is why you want to make sure that you have it correct. See the photos below for reference. This is incorrect. I’m sure you would be able to make it work but its going against the natural flow of the hair. 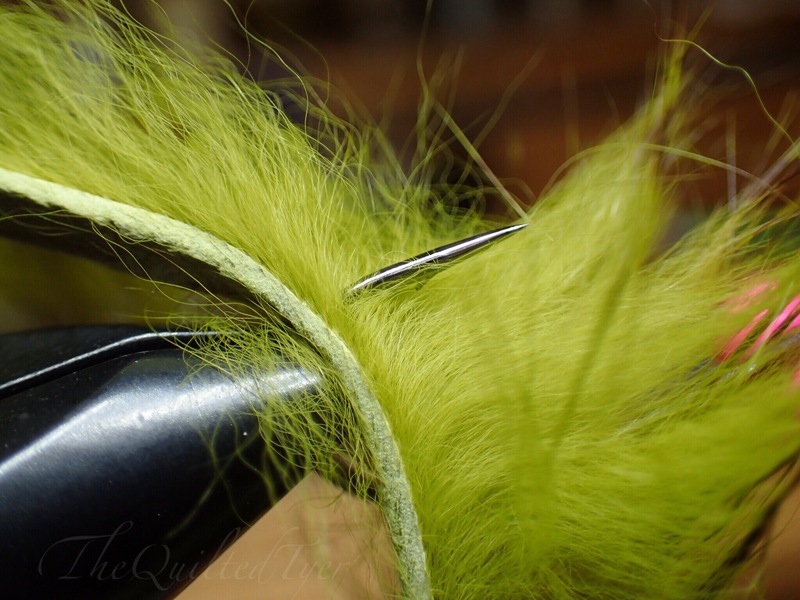 If you have the ends of the rabbit fur pointing over the hook eye; spin it around. This is CORRECT. This is the way it should be facing. The natural flow of the hair should be trying to face over the bend of the hook. 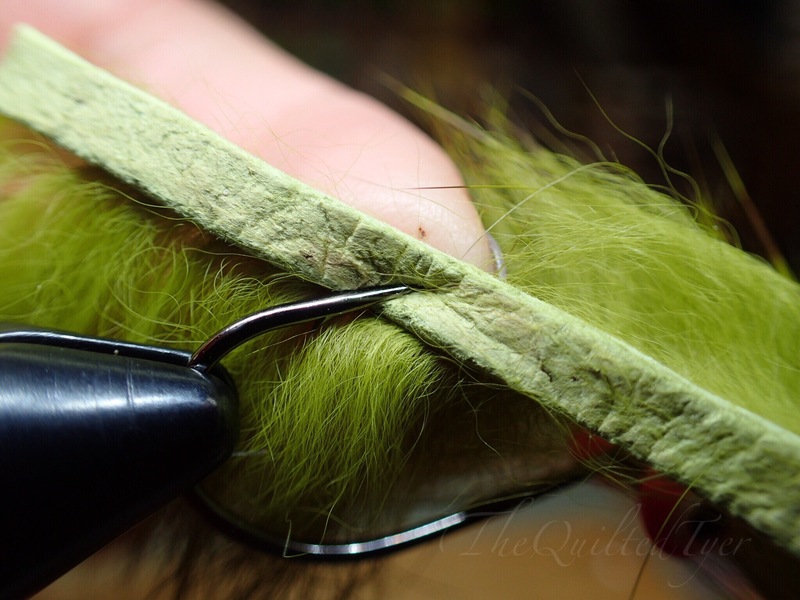 One you have established that the strip is facing the right direction, use a little bit of water on your fingertips to smooth out the fly away fibers. 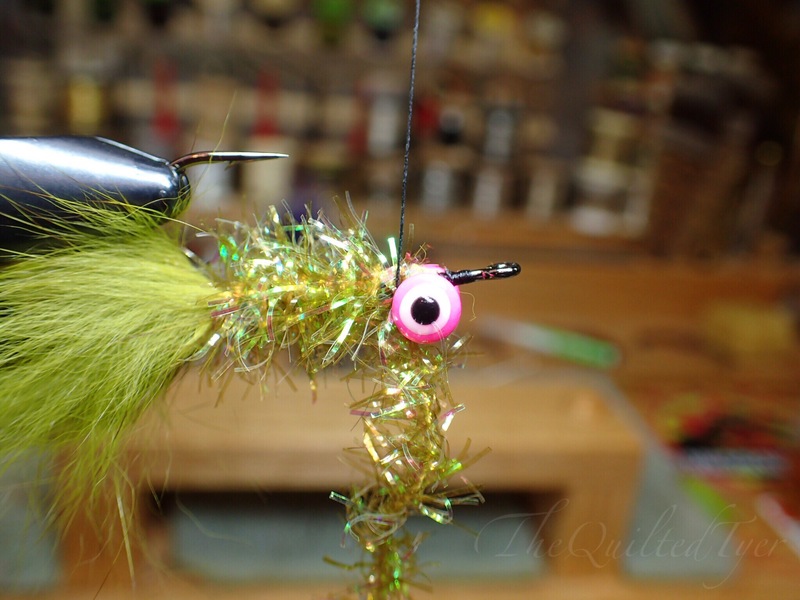 This will allow you to see what is going on a little better as you tie. A uniform underbody is very important to the finished fly, so instead of cutting off the rabbit strip we will by tying over it. 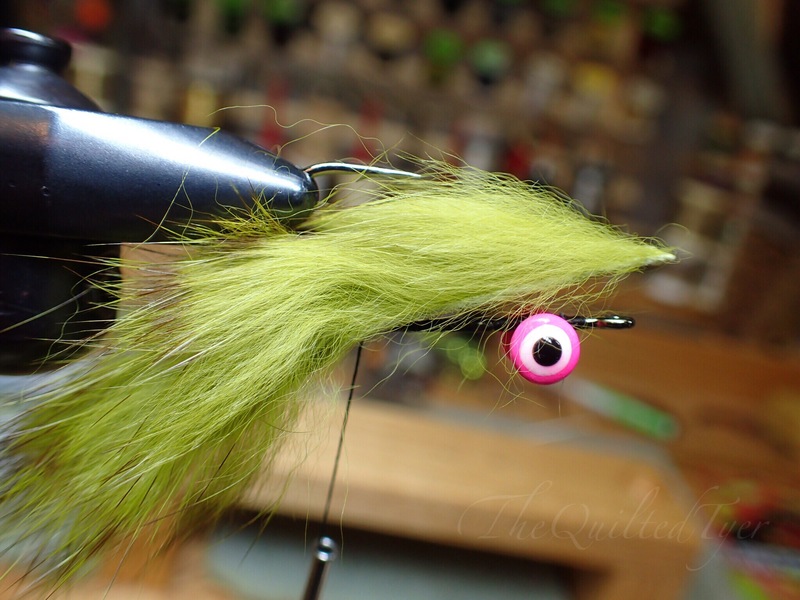 Smooth out the fly away fibers with a little water. 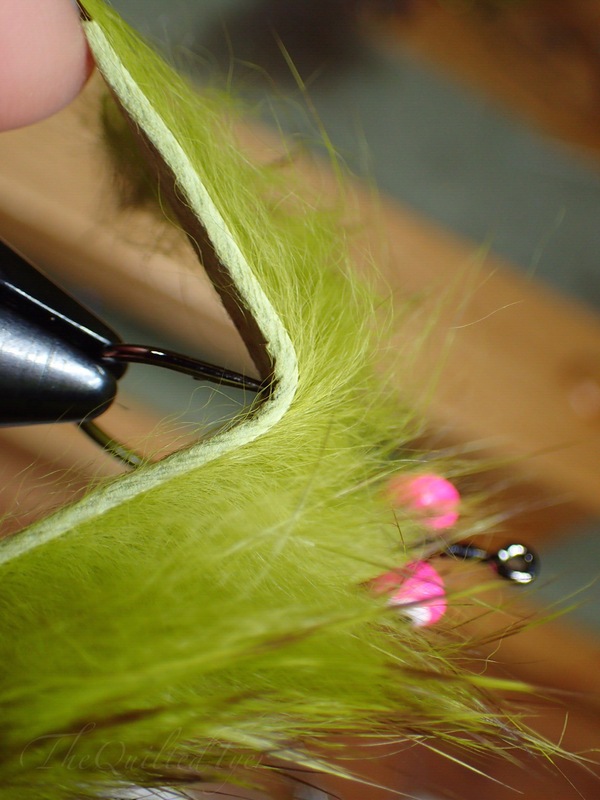 Grab a hold of your rabbit strip at the base of the hook right before it bends. Take wide spaced secure turns over the strip, being careful to avoid it spinning. I know it looks horrible right now but bare with me! This is the least frustrating way to do this. Once you reach the dumbbell eyes, an angle cut versus a straight cut will better ensure the material lays flat. Take your scissors and create an angle cut in the rabbit strip. Accomplish this by holding the material vertical and cutting horizontal. It will create a V. Use the scissors to cut the material off and then cover the waste ends. Now you can now cover that mess with tight thread wraps. 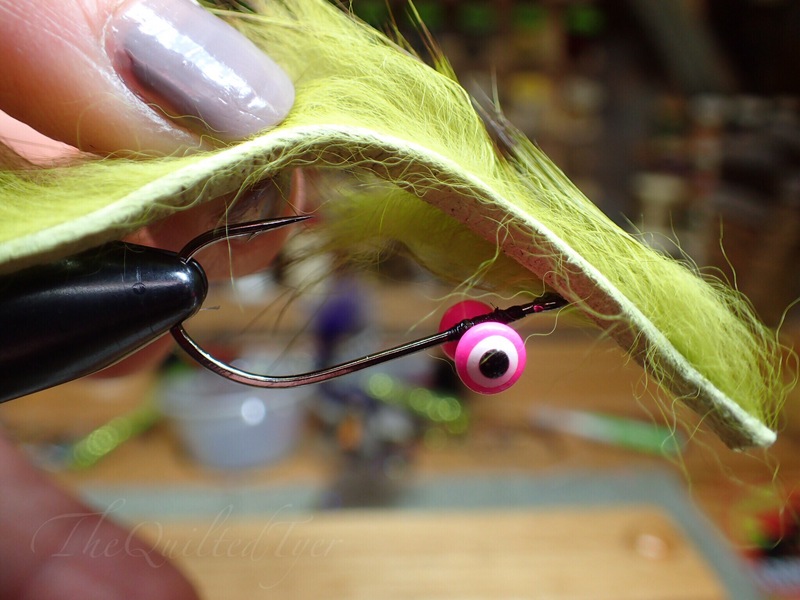 Bring your thread all the way to the base of the hook shank and leave it there. 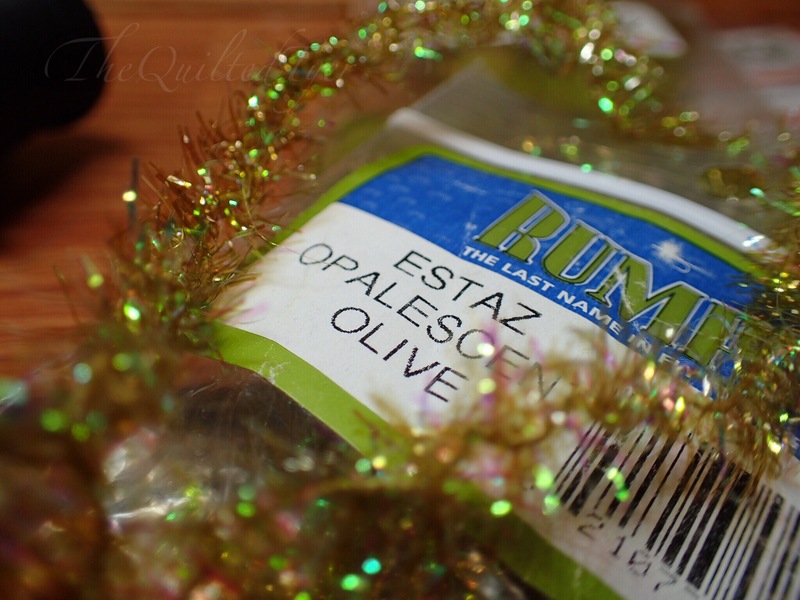 Grab your Estaz and get ready to tie it in. Here’s a quick tip for tying in Estaz. If you take a closer look at the material below you will see that it has no clear “end” for tying in. The end of a length of Estaz. What you want to do is grab that material in your fingertips and using your fingernails, strip the excess material off of the center cord. This will expose the center and ensure that you have a clean tie in point with no bulk under the body. Stripped Estaz ready for tying in. 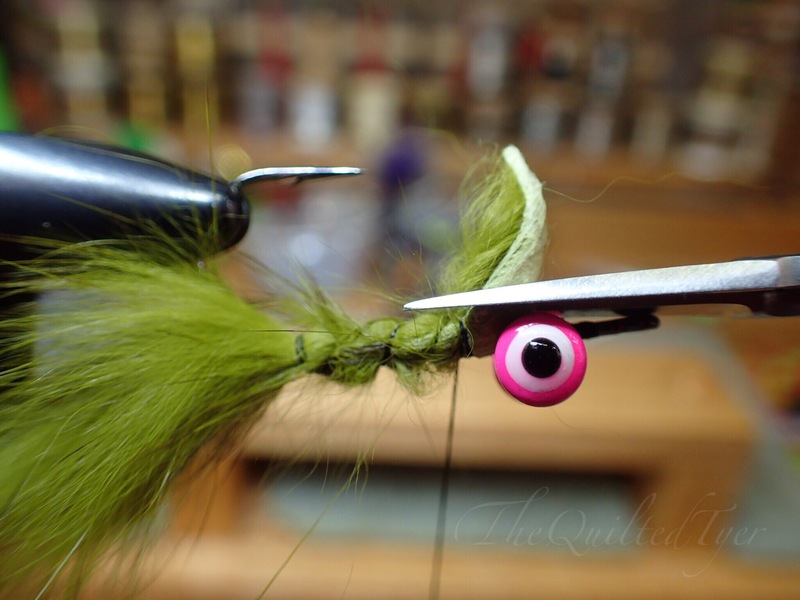 Tie your material in at the base of the tail and move your thread up behind the dumbbell eyes. 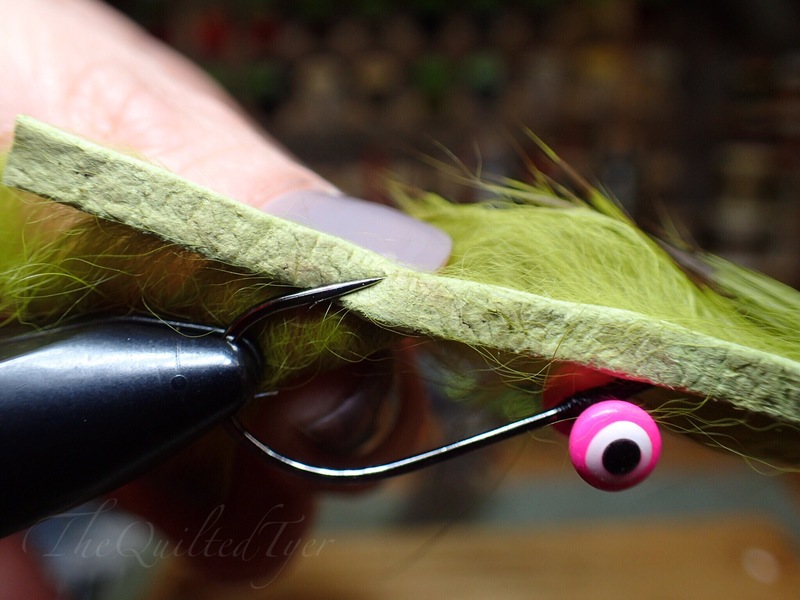 Take touching wraps up the hook shank with the Estaz, but be sure to brush back the material with each wrap. Bring the material forward and brush it back with each touching turn. This will keep the Estaz from getting matted down. Once you reach the back of the dumbbell eyes you are going to want to stop. This is where you’re will be adding the rubber legs. I recommend locking in your material slightly before you add the rubber legs this way when you turn your vise over it’s not going to come apart. Locking in your material at different stages in a pattern will become second nature to you after a while, but if you haven’t dont it yet, here’s a quick 2 photo demonstration. Begin with your thread on the backside of your fly and the material in the front closest to you. Bring your material forward slightly and hold it steady. With your thread coming from the backside of the hook, bring it straight up. Once you have brought that thread straight up, you have essentially locked in the material. But to ensure that it is totally locked in, simply take a wrap around the hook. Time to tie in some legs. The color choice is up to you, so use whatever you have on hand and adjust it to your needs. Grab one strand per side since we will be folding them over to create two on each. Use the slide loop technique to attach the folded over legs. Slide them up behind the eye. 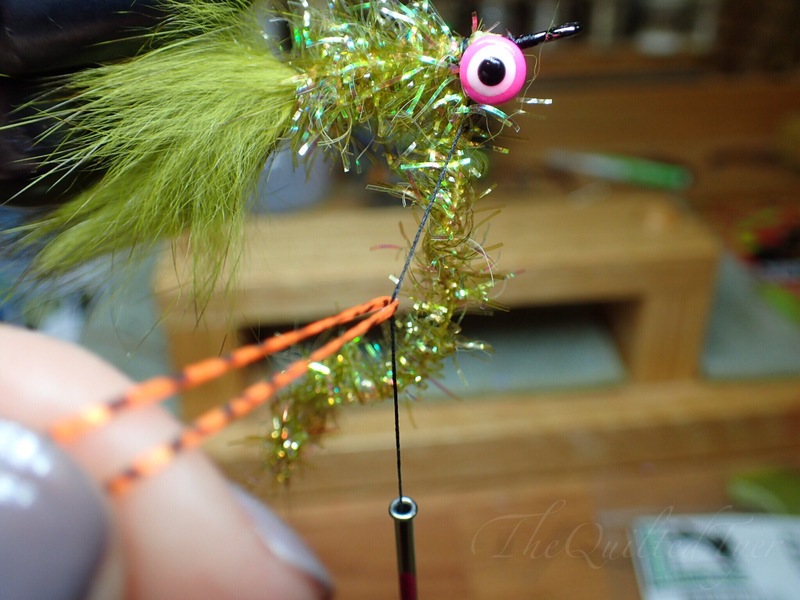 Now flip your vise over and do the same to the other side. 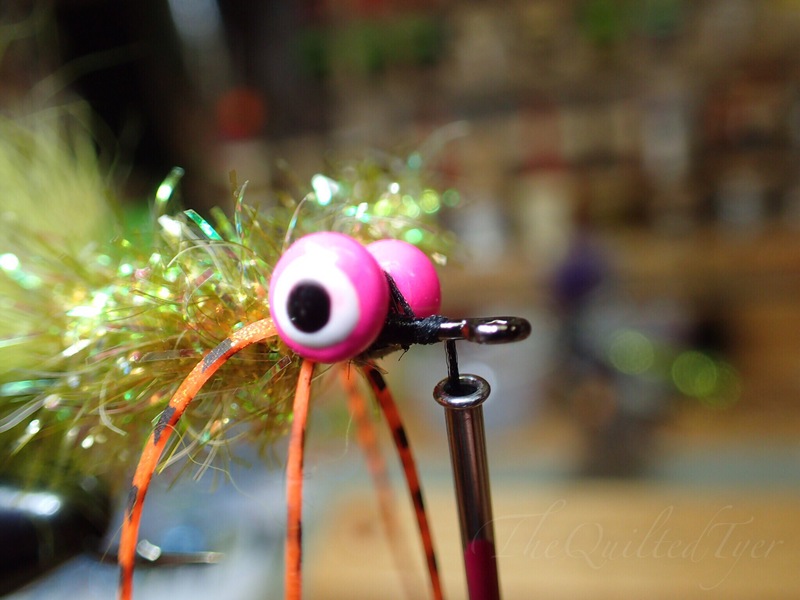 Return your fly to the starting position and do a half hitch or one turn whip finish in front of the eyes to secure the materials before continuing. Now you need to cover the front of the fly with the Estaz because it will create the head and fill out the gaps. Bring your material up and over the dumbbell eyes. Pull it over the middle then wrap it under that hook eye and back up. The continue to do this again towards the back. Only a few more wraps to go! Be sure not to crowd the eye as the material has a tendency to go a little haywire up in the front. Just do one turn around the front of the eyes and tie your material off. That’s it! 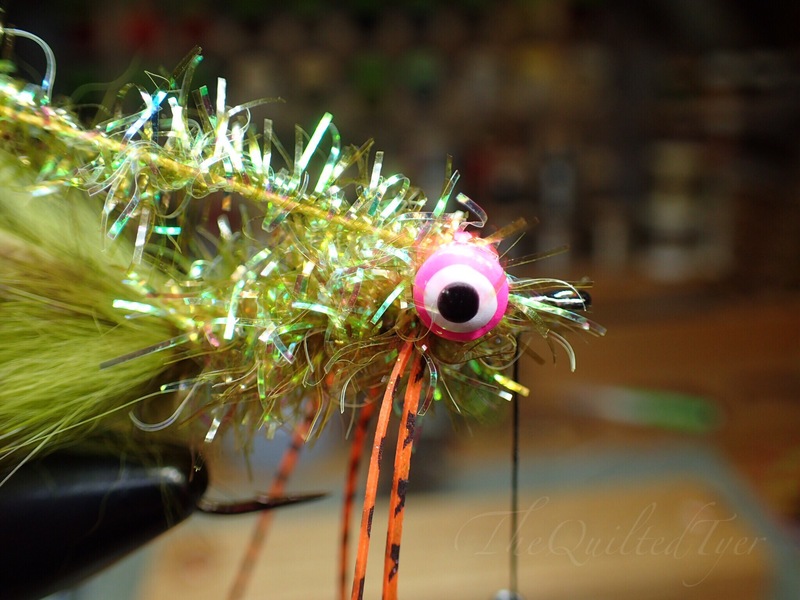 I hope this fly brings many fish to your net. 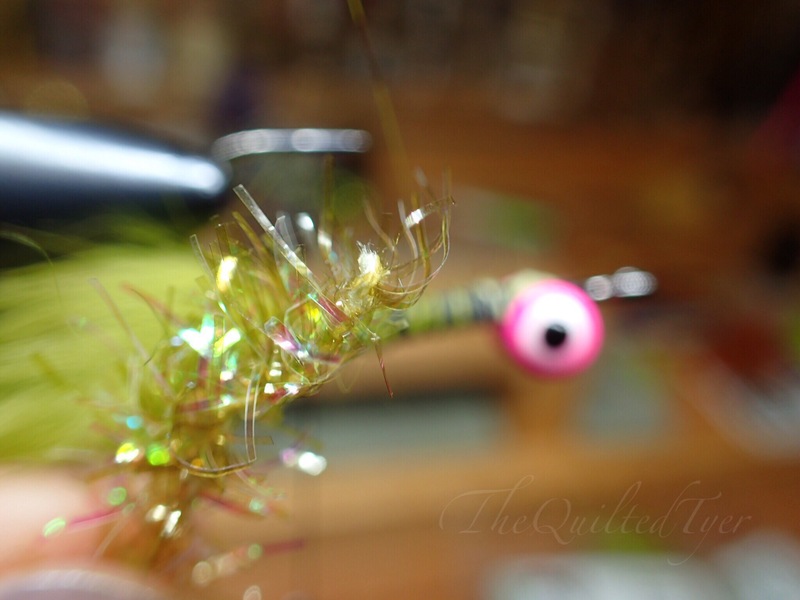 There aren’t too many wrong ways to fish this fly since its gives so much movement on its own as it sinks. If you are fishing it in a river I would hop it like a crayfish or swing it. If you are fishing in a lake I highly recommend casting it out and waiting. Just watch the line as it sinks, then be ready to set the hook. 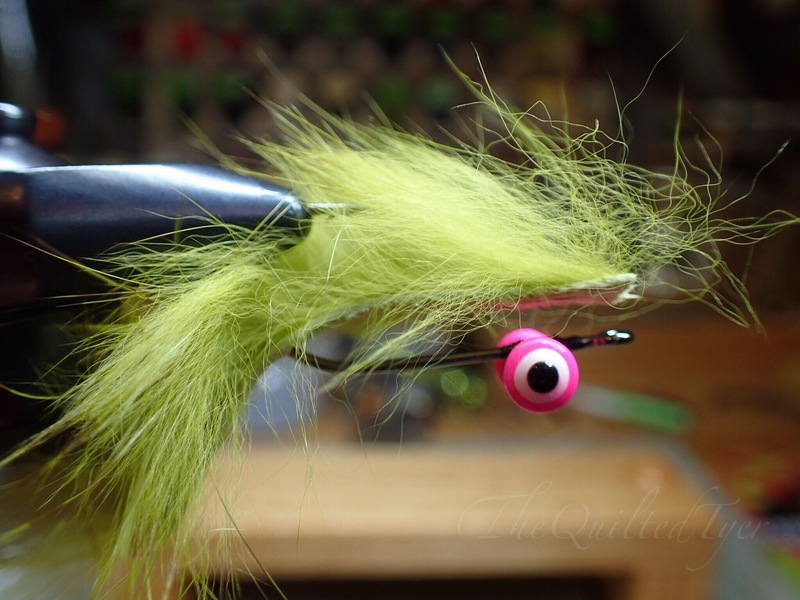 I have had so many takes on a slow sinking fly after I cast out, and missed even more when I wasn’t paying attention. If you are in clear lake, rock ledges and lower water to the point that you can see the bottom, I recommend a full sink line again or a sink tip at the very least. Cast it out, watch it sink to the bottom. Then twitch it. Give it a second again. If you feel a bump, set the hook and nothing is there.. Just wait. Small mouth will grab and stun their pray before making the full strike. So Strip the line, sink, and twitch across the bottom. Keep doing it and vary different retrieves. You would be heart stopping surprised at the monsters me and my husband have seen fighting over these flies on a rock shelf. If you were fishing lake that has more of a red tint to it or stained and muddy conditions I would cast it out and give it a few seconds to sink. I wouldn’t really change the color on it, if anything maybe add some flash to the tail for the darker conditions. 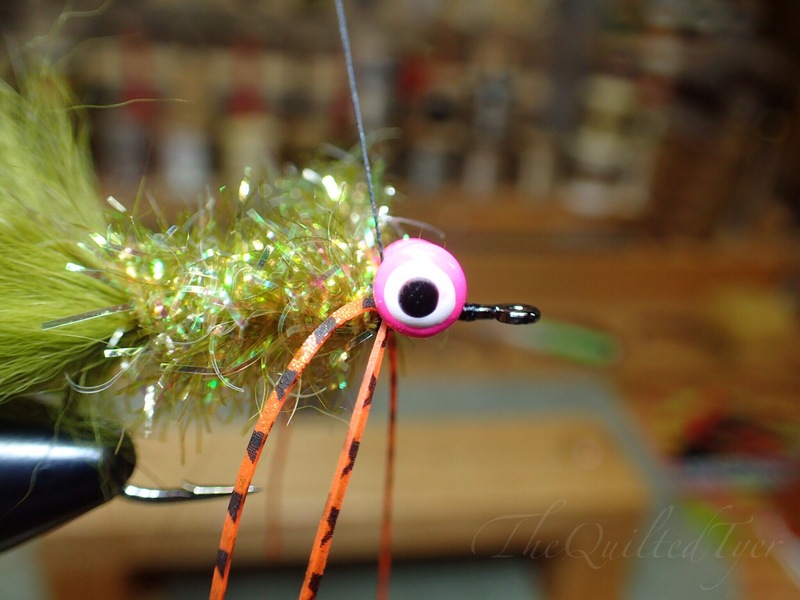 If you have an idea how many feet per second your fly line is dropping, then you will have a good idea on where your fly is in relation to the water column. But for the most part I will simply cast it out and Give it like five or six seconds to sink, then strip the line. Always give it a few more second of sinking, and then strip it again. Repeat this all the way back to the boat. Here and there change it up with a fast strip or stop and twitch but Keep an eye out because I’ve missed fish right at the boat as it was rising to the surface. I look forward to another trip to this little spot to do more research. 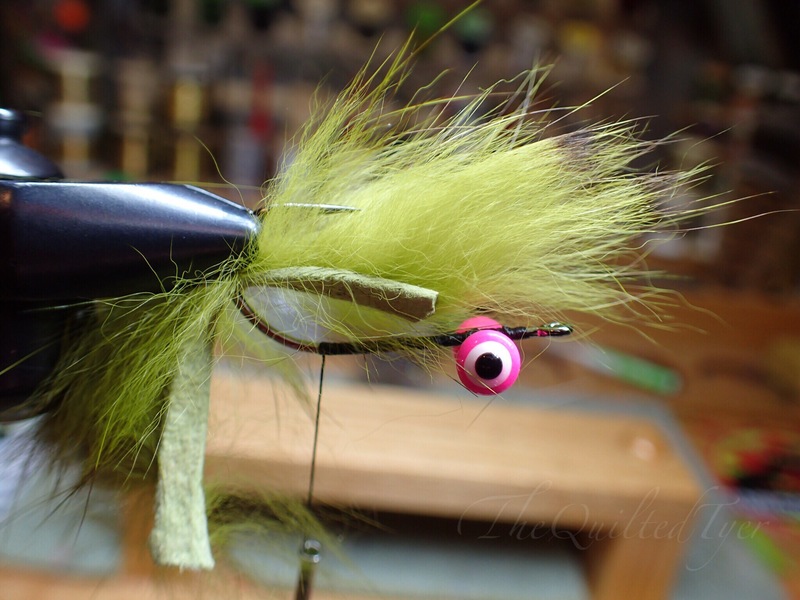 Happy tying! You’re very welcome! Please let me know how they work for you I would love to see some photos of Australian bass. Thank you very much. And Absolutely! Me and my husband were just taking about that. 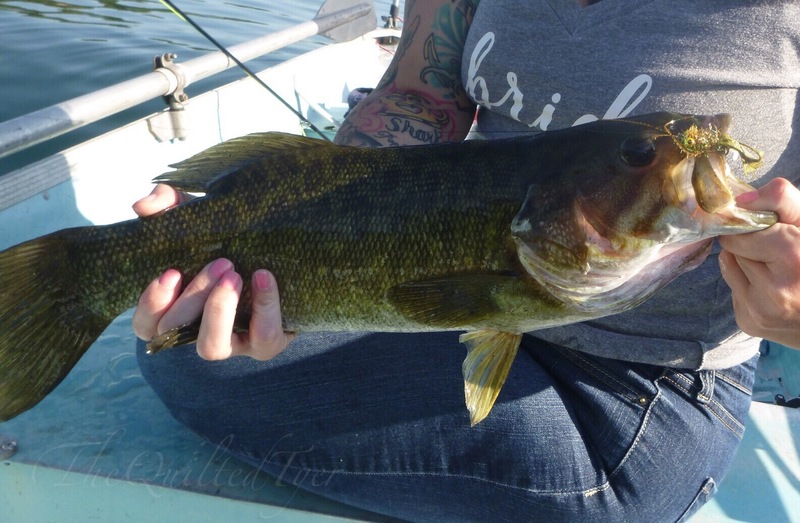 I have been so “homesick” for sitting in my boat in the middle of a lake in summer right now ,that bass fishing is all I can think of. 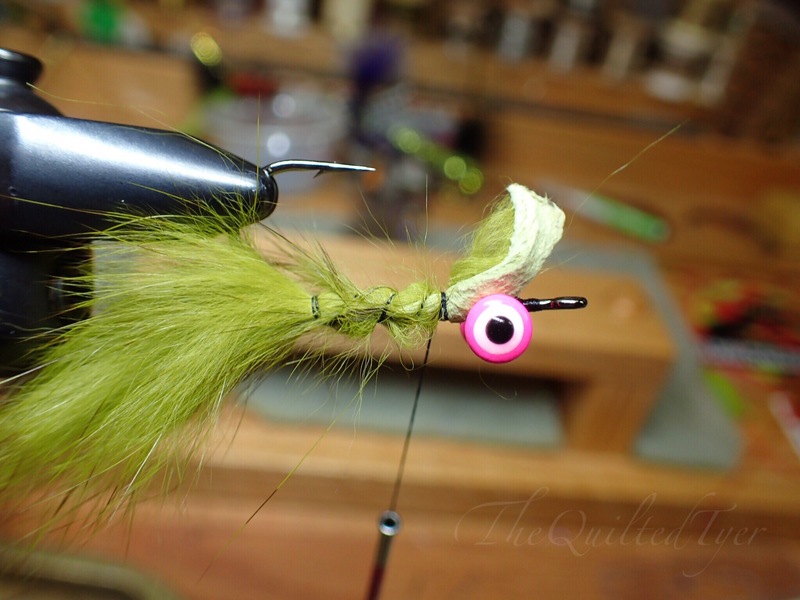 Thanks for the tying tips. I put some together this week. 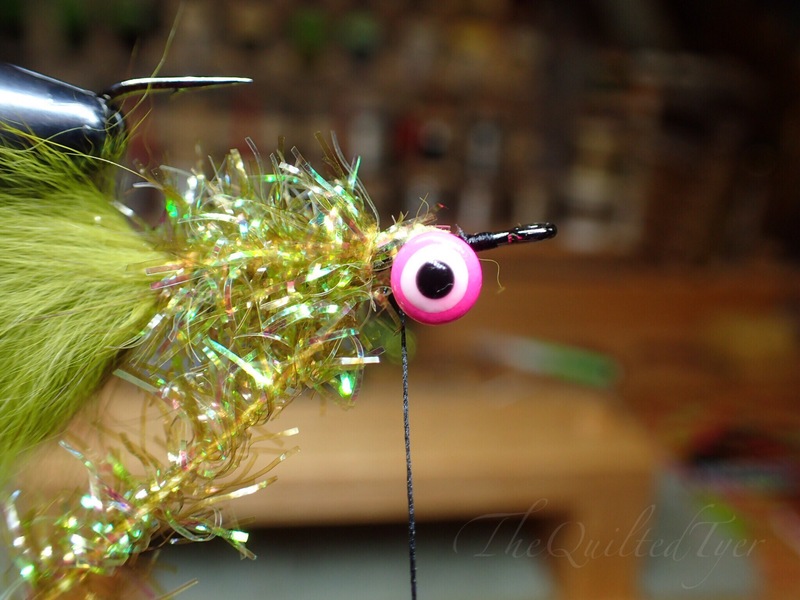 They have tons of motion just sitting on the table – that should really attract the bass !! !